DIGITAL LINK sends HDMI, uncompressed HD digital video, audio and control signals (Ethernet, RS-232C) through a CAT5e cable or higher for up to 100 m (328 ft). Long Reach Mode supports up to 1080/60p signal transmission for 150 m (429 ft), (for the PT-DZ780 projector only*1). Lower cabling costs and reduced wiring complexity. Self-contained with integrated splitter, switcher, scaler, and DIGITAL LINK conversion technology. 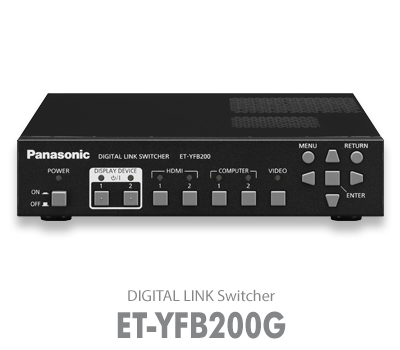 Connect multiple ET-YFB200G switchers to accommodate extra display devices. Connect multiple source devices with HDMI in x 2, Computer in x 2, Video in. Features audio inputs x 3. 2 x DIGITAL LINK outputs to distribute AV and command signals to two projectors or displays. DVI-D output allows outgoing signals to be visually confirmed on a PC monitor. The ET-SWA100 Early Warning Software (optional) allows failures to be easily identified and fixed. In-Browser Remote Control from PC or tablet (functionality limited). On/Standby buttons on front panel for individual display devices. *1 As of April, 2015. *2 For the Panasonic’s DIGITAL LINK-ready projectors and professional displays. WUXGA60-CVT-RB(1920 x 1200): fH 74.04 kHz; fV 59.95 Hz, 1080/25p(1920 x 1080): fH 67.50 kHz; fV 60 Hz, SXGA+60(1400 x 1050): fH 65.22 kHz; fV 60 Hz, 1366 x 768/60(1366 x 768): fH 47.71 kHz; fV 59.79 Hz, 1280 x 800/60(1280 x 800): fH 49.70 kHz; fV 59.81 Hz, XGA60(1024 x 768): fH 48.36 kHz; fV 60 Hz, 720/50p(1280 x 720): fH 45.0 kHz; fV 60 Hz, 1080/24p(1920 x 1080): fH 27.0 kHz; fV 24 Hz 1080/30p(1920 x 1080): fH 33.8 kHz; fV 30 Hz 1080/50p(1920 x 1080): fH 56.3 kHz; fV 50 Hz, 720/60p(1280 x 720): fH 37.5 kHz; fV 50 Hz, 1080/60p(1920 x 1080): fH 28.1 kHz; fV 25 Hz, Dot clock frequency: 65.0 MHz to 154.0 MHz The supported output signal for the terminal/ terminal is same as the terminal. However, output of 3D signal is supported only by the terminal/ terminal, and it is not supported by the terminal. G: 0.7 Vp-p ( 1.0 V p-p for sync o n G), 75 ohms; HD/VD, SYNC: h igh impedance, T TL (positive/negative) NOTE: SYNC/HD and VD terminals do not accept tri-level sync signals. Y: 1.0 Vp-p (including sync signal); PB (CB), PR (CR): 0.7 Vp-p, 75 ohms C: 0.286 V [p-p] 75 ohms Only the terminal can input Y/C signal using the optional D-SUB - S Video conversion cable (Model No. : ET-ADSV).